Polyethylene LDPE has a high degree of short and long chain branching. It is one of the most simplest and common polymer. It has, therefore, less trong intermolecular forces as the instantaneous-dipole inducted-dipole attraction is less. This results in a lower tensile strength and increased ductility. LDPE is created by free radical polymerization. The high degree of branching with long chains gives molten LDPE unique and desirable flow properties. LDPE is used for both rigid containers and plastic film applications such as plastic bags and film wrap. LDPE Polyethylene are the most commonly industrially produced plastics. The various types of polyethylene are labelled according to their density. Low-density polyethylene, i.e. 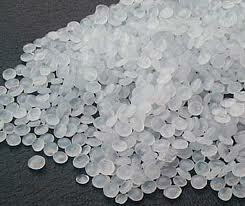 polyethylene with a density of between 0.91 to 0.94 g/cm³, usually referred to as LDPE. LDPE is mainly used for packaging products. Global revenues generated with LDPE amounted to almost US$33 billion in 2013 and the market research expects sales to increase by 1.5% p.a. until 2021. Plastic came to the fore during the World War II years, first as an underwater cable coating, then as a critical insulating material for such vital military applications as radar cable. It was not until the end of the war that the plastic was taken off allocation and freed for consumer use. From that point on, its rise in popularity for both consumer and industrial uses was so spectacular that polyethylene became the first plastic in the U.S. to sell more than 1 billion pounds a year. Today, it is still the largest volume plastic in the World. Applications for polyethylene are many and varied, including: packaging films; trash, garment, grocery and shopping bags; molded housewares; toys; containers; pipe; drums; gasoline tanks; coatings and many others. Polyethylene are thermoplastic resins obtained by polymerizing the gas ethylene [C2H4]. Low molecular weight polymers of ethylene are fluids used as lubricants; medium weight polymers are waxes miscible with paraffin; and the high molecular weight polymers (i.e., over 6000) are the materials used in the plastics industry. Polymers with densities ranging from about .910 to .925 are called low density; those of densities from .926 to .940 are called medium density; and those from .941 to .965 and over are called high density. The low density types are polymerized at very high pressures and temperatures, and the high density types at relatively low temperatures and pressures. A relatively new type called linear low density polyethylene is manufactured through a variety of processes: gas phase, solution, slurry, or high pressure conversion. A high efficiency catalyst system aids in the polymerization of ethylene and allows for lower temperatures and pressures than those required in making conventional low density polyethylene. 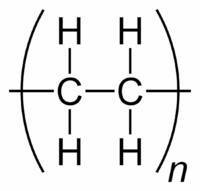 Copolymers of ethylene with vinyl acetate, ethyl acrylate, and acrylic acid are commercially important.